Product code: ES3877 Categories: Sold Items, Sold Rings. The Art Nouveau period of the late 1800’s to the start of World War One is easily distinguishable by having wonderful flowing designs which can be seen here in this gorgeous diamond ring from the Art Nouveau era. 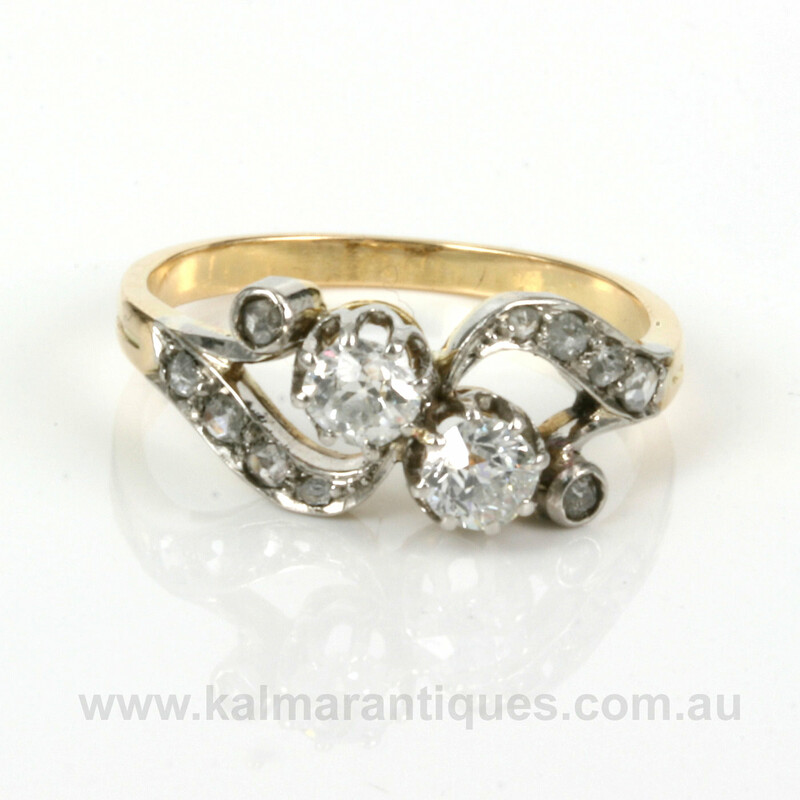 Hand made in 18ct gold in France, this ring would date from the early 1900’s and is set with two lovely European cut diamonds that sit somewhat opposite each other from each side of the swirl design band. And as can be seen the band itself is set with 4 rose cut diamonds with a further one leading from the band to the main diamonds themselves. The 2 main diamonds total 0.54 carats and the rose cut diamonds 0.08 carats. From left to right the ring measures 17.9mm across by 8mm wide at the centre and looks amazing on the finger. French jewellery is spectacular and any antique French jewellery from the wonderful era is even more so.